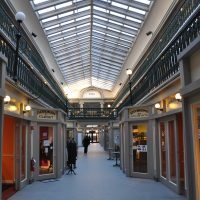 The Arcade Providence (formerly known as the Westminster Arcade) runs from Westminster Street (northwest) to Weybosset Street (southeast) in the heart of downtown Providence. It’s the oldest mall in America, built in 1828, and declared a National Historic Landmark in 1976. Recently refurbished, it’s now home to the likes of New Harvest Coffee & Spirits on the ground floor and micro-lofts (affordable accommodation) on the first floor. The Arcade has two entrances, with a couple of ways of getting into New Harvest too. Personally, I recommend using the Arcade’s grand portico entrance on Westminster Street, although there’s always the less-ornate back entrance on Weybosset Street. Either way, New Harvest is about halfway down on the left (Westminster) or right (Weybosset), with glass double-doors and a large bay-window projecting out into the central corridor of the Arcade. The alternative (and least glamourous) entrance is via the back stairs which lead up from the car park, meaning you completely miss the Arcade’s magnificent interior. However, it’s the only way in when the Arcade itself is shut (eg late at night). I visited twice, first in 2015 during my epic coast-to-coast train trip, and again this time last year on my return to New England. It’s an interesting space, with the counter/bar on the left, seating on the right. The counter runs diagonally from the left-hand wall to almost halfway across the store, starting with alcohol and finishing with the coffee, the cake (in a display case built into the counter) and till separating the two. The espresso machine, a La Marzocco Strada, is at the far, right-hand end with its two grinders, the obligatory bulk-brewers and flasks on the work surface behind them. An awkward, small, square pillar opposite the espresso machine has cleverly been turned into a feature as the takeaway station, while there’s a retail shelf on the back wall next to the steps down to the back-door. If you fancy sitting at the bar-end of the counter, there are five chairs, each with its own hook under-bar for hanging your coat, etc. It’s a very different experience, by the way, sitting at the bar, compared to in the coffee-shop part. There are three round, two-person tables in the middle, while a three-sided bar occupies the half-hexagon bay window to the door’s right. A wooden bench runs along the right-hand wall, with three square two-person tables, followed by a three-person bar next to the steps to the back-door. There is some natural light from the generous windows at the front, borrowed from the Arcade’s central aisle, but otherwise it’s subdued inside. I had a cortado, which was commendably short and came with a glass of still or sparkling water. The espresso blend was bright and fruity, quite unusual for America. It went well in milk, providing a marked contrast to the bulk of cortados/flat whites/cappuccinos I’d had on the trip. On the first mouthful, the fruity nature of the coffee came strongly through the milk. It mellowed considerably on subsequent mouthfuls and, by the final mouthful, it was a real treat: a rich, complex blend of coffee and milk. I paired this with a very tasty cranberry and apple pie. This had plenty of rich chunks of apple with a healthy dose of cranberries as well as great puff pastry. This entry was posted in Bars, Cafe/Roaster, Cake, Coffee & Wine, Coffee Shops, Evening Opening, Laptop Friendly, Late Opening, Providence, Retailers, Victorian Arcades and tagged include, New Harvest, PortlandPortland2015 by Brian Williams. Bookmark the permalink.